* A whimsical little story inspired by the Royal Wedding……. It was funny that Aunt Julietta was so into the Royals because she had grown up in a very anti-monarchist household with as she called them a lot of anti-Establishment non-bra wearing treehuggers. The non-bra wearers often made digs at Julietta’s obsession with the Royals. Use some of the money you spend on the Charles and Camilla teatowel collection to have a nice holiday. Sponsor a whale or a polar bear instead of buying that porcelain figure of Princess Anne riding at Ascot. No one talks about the Duchess of Gloucester any more. You should sell her set of pill boxes on EBay. Julietta didn’t care what the non-bra wearers thought. She didn’t need to go on holiday, she was happy in her little house with all her beloved Royal faces around her. There was no way she was ever going to sell any of her things. Or sponsor a polar bear. But there was one thing she wanted above all else, one very important thing. 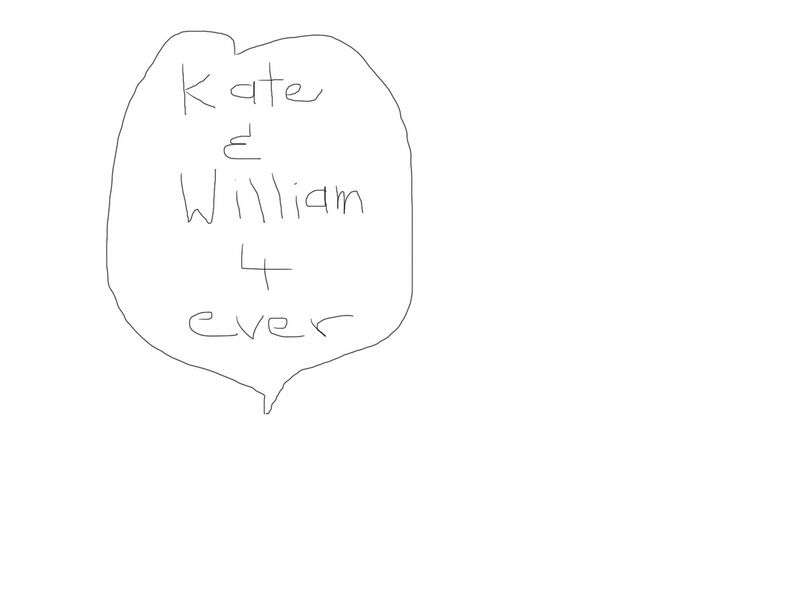 She wanted her darling Kate to find her own Prince William. A lot of people remarked on how much her Kate looked like the real Kate. The resemblance was so great that Kate could have worked as one of those celebrity lookalikes alongside all the David Beckham and Kylie Minogue impersonators; as well as that presumptuous person who masqueraded as Her Majesty, Queen Elizabeth II – who looked nothing like Her Majesty at all. Took liberties, that woman did. Her Kate had the same hazelnut hair, gentle, wide eyes and open smile as the real Kate. She was fun and elegant. In fact, Julietta thought she was more elegant than the real Kate. She was beautiful, but single. A lot of the treehuggers didn’t understand why Kate was single when she was such a catch but Julietta understood. It was obvious, really. Blindingly. Kate was waiting for her Prince. Every night as Julietta listened to the BBC World Service in the kitchen drinking tea kept warm with the limited edition Princess Margaret tea cosy all her bingo friends coveted, she prayed, partly to God and partly to Princess Margaret (who had known more about the vagaries of love than most mere mortals, truth be told and therefore was a sort of muse on matters of the heart, Julietta believed) that her darling Kate would find her Prince. Julietta had faith in God and in her muse in equal measure. Kate finding her Prince was only a matter of time. Julietta was having trouble with her knees. No surprise at her age but it made her angry when the treehuggers said she had put too much stress on her joints from all the curtsying she did in front of her bedroom mirror when she played Meet The Queen. Some people had no imagination or sense of propriety. Julietta’s knee joints might be shot but if and when she met the Queen she would be ready with the finest curtsy ever seen. It would make the front pages, of that Julietta had no doubt. Her knees took her to the offices of her orthopaedic surgeon. When she got there the receptionist informed her with a flustered air that her usual surgeon was off sick. Julietta walked into the doctor’s office. He was a tall man, fair, with a regal air. He held out his hand: ‘William Windsor’, he said. Julietta had to swallow down an involuntary curtsy. The operation took place on a day when the cherry blossoms were in bloom. The pathway to the orthopaedic wing was strewn with delicate pinks and whites. It was the type of scene one might expect to see at a Royal wedding. There was the slightest hint of expectation and promise in the air. Julietta had convinced her Kate that she was the only one she trusted to take her to the hospital. She walked along the pink and white path on her niece’s arm relishing the way the afternoon sunlight filled Kate’s hair with golden flecks and made her eyes a deep, warm chestnut. She hadn’t been this excited since she had acquired the exact replica of Princess Michael of Kent’s hat that she had worn on her last visit to Australia which Julietta had worn to the Melbourne Cup and believed had been the direct cause of her picking the winning horse. When Julietta woke from surgery she felt a heaviness in her knees and a discomfort from all the tubes coming out of her arm. She felt like complaining a bit until she heard a laugh. More of a trill, really. Like crystal chimes. Her Kate’s laugh. Kate was standing by the window talking to Doctor Windsor. William. They were both laughing, leaning into one another, enjoying the moment. Julietta’s heart fluttered. She thanked God for that Princess Margaret tea cosy. Not for the first time. Julietta stayed in hospital for three weeks. She didn’t mind the hospital food or even the fact she couldn’t get the BBC World Service on the hospital radio station but she disliked the weak tea served in polystyrene cups and the graffiti in the bathrooms. Julietta didn’t care about who loved whom or that she should call Karl for a good time or that Angie was a ho. Julietta didn’t even know what a ho was. She assumed it was some kind of minority religious group. On the day of her discharge Kate came to take her home. She looked sheepish. Julietta felt her heart soar. True love. ‘It doesn’t sound crazy at all,’ she said. As her Kate packed her bags, Julietta made her way to the bathroom. She had one more thing to do before she left. She pulled out her Prince Philip Memorial Pen and added her own touch of graffiti. She surrounded the words with a heart. Her graffiti stood out, fresh. The Prince Philip Royal Airforce Pen, commemorating his appointment as Marshal of the Royal Air Force was a gel pen that supposedly glowed in the dark, although Julietta had never tried it. Seeing what she had written on the bathroom wall made it real somehow. Julietta touched the heart on the wall and her own heart. She would have to come back sometime to see if the ink actually did glow in the dark. But she knew without seeing it that it did. It touched her deep inside. And she knew in her heart that what she had written was true. Did you see the commemorative mugs made in China? They carried portraits of Kate Middleton …. and Prince Harry! FAIL!! And, years ago, we had a mug commemorating the wedding of Princess Anne to Lieutenant Mark Phillips. Trouble was, they made him a Captain three days before the wedding. And, my great-uncle, a shopkeeper, got stuck with a whole shedload of souveninrs commemorating the Coronation of King Edward VIII … which, of course, never happened. There are one or two items from this ‘collection’ still around in the family; I have a comb and case. Wonder how much it would fetch on eBay? Oh Selma that was brilliant! 🙂 I loved every word! Awww… This is just charming, Selma. I loved Aunt Julietta and her dedication to her collection. I had to chuckle at the paragraph about Julietta practicing her curtsy. Her “knee joints might be shot but if and when she met the Queen she would be ready with the finest curtsy ever seen. It would make the front pages, of that Julietta had no doubt.” Were I ever to attempt a curtsy before the Queen, I’m quite sure I’d make the front pages as well. The cameras would capture my royal crash to the floor at the Queen’s feet when my knees gave out. Oh Selma, absolutely delightful and my god I just finished reading Maeve Binchy’s Light a Penny Candle and damned if you dont’t sound JUST like her style! Well done girly, me likes alot! I’m always attracted to the style of writing that reads the way real people actually talk and you’ve got it! Boy do you ever ! *clap clap* Take a bow woman! You’ve excelled yourself again Selma – funny, delightful, whimsical and perfect for this weekend’s wedding celebrations. Love all the little details you put in your stories. My Mum always hated weak tea too 🙂 What I would give for a ride in one of the magical horse drawn carriages we saw on the tv last night – sigh! Like a delightful little English novel excerpt. Oh Selma, you are bringing out the emotional love lorn romantic in me. Hrummp, gonna get me some beer!!! NOOOOO!!! That is priceless. Oh, wait till I tell my son that – he is going to kill himself laughing. Only in China….. I am so glad you liked it. Thank you for always being so supportive. I am so glad. Thank you so much! I have a bit of a trick knee thing going on too. If I had to curtsy I might disgrace myself. My break dancing days are over. LOL. I would love to ride in one of those carriages. Weren’t they magnificent? Although did you notice that the one the Queen and Prince Philip were riding in had a bit of a lean on it when they were getting out? We were praying the suspension wouldn’t give out! I like a bit of a romance too. Makes me feel happy. And I do love a good fairytale ending!!! A wonderful story, Dr. William Windsor, I love it.